This year’s Washington State SAR Conference is fast approaching. It’s being held June 17-23, 2019 at Central Washington University (CWU) and the Kittitas Valley Events Center (KVEC) in Ellensburg. The conference web site is http://www.wasarcon.org/. There is an excellent line up of both pre-conference courses and conference classes focused on SAR incident management, search planning, and SAR leadership. See the conference web site for full descriptions, more class offerings, and registration. Big Shaker – Get Your Shake On! The Snohomish County Department of Emergency Management and the Everett Clinic will be hosting the first ever Big Shaker event on Friday, April 19 from 11- 2pm, 3813 Rucker Ave, Everett. For those of you who have not heard of the Big Shaker, it is a mobile earthquake simulator that has the ability to produce shaking equivalent to a magnitude 8 earthquake! Helicopter Rescue Team Open House in Support of World Helicopter Day! Join us at Taylor’s Landing from 10:00am until 2:00pm on Sunday, August 19th in support of World Helicopter Day! Our aircrew will be on hand to give tours and explain what we do, the equipment we use and talk about some of our recent rescues! Get up close and personal and learn more about our two helicopters, Snohawk 1 and Snohawk 10! Sgt. John Q. Adams has been with the Snohomish County Sheriff since he left the U.S. Marine Corps in 1996. John served 10 years as a patrol deputy in South Snohomish County and was promoted to Master Patrol Deputy while there. He has served in Property Crimes, as a member of SWAT and as a Dive Team member. He is also a member of Everett Mountain Rescue. 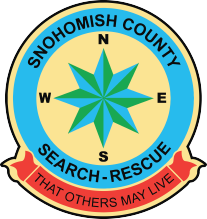 John has a strong interest in the wilderness of Snohomish County and began preparing to apply for the SAR Sargent position before it was open. He went on a few missions to get to know how SAR operated, learn policies and be ready when the job opened. This year our SAR Sargent for the last 22+ years, Sgt. Danny Wikstrom, retired. Sgt. Adams was ready and applied for the position. He received his appointment to SAR Sargent in February and is ready just in time for the 2018 rescue season. We look forward to working with Sgt. Adams!